It all started with Brian Lobel casually walking onstage where a study table was set, typing a Facebook status onto his own Facebook account to communicate with the audience. He spent the first couple of minutes reacting to the audience spontaneously as well as typing every thought that comes to his mind. It was the most mundane of things, and something most of us are guilty of whenever we get on to our social media accounts. Giving updates about our lives has become a habit. For others, completely second nature. How is it possible that such an everyday act can qualify to open for the performance lecture? Interestingly, this common act connected him to the audience instantly (with the help of some free cans of beer, of course). Laughs were ringing out, answers came from different parts of the Yale-NUS Performance Hall and then “Purge” was ready to begin as the lights dimmed. 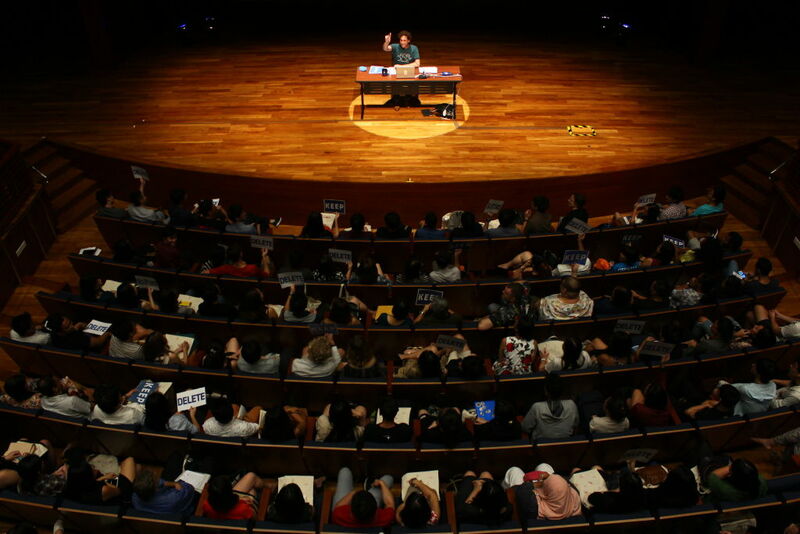 Despite the performance hall being a big space, the atmosphere transformed into a more intimate setting as the performance lecture went on. No longer was there the clear distinction between performer and audience; we were all part of the performance in the form of an on-going conversation. Even though I would think that a Black Box space may have worked out better, Lobel managed to make everyone feel at home which led to successful audience interactions throughout the night. From lifting up “Keep” and “Delete” signs to sharing of various perspectives on the decision-making process, it was a constant back-and-forth of ideas bouncing off walls as well as thoughtful silences when two volunteers went onto stage to delete and add a person respectively. Even though there were so many things going on, Lobel himself was still the highlight of the night. As a performer, he was charming and energetic. Attempting a one-man show is never easy but he pulled it off almost effortlessly. Not once did he lose the audience’s attention, maintaining his presence from beginning to end. 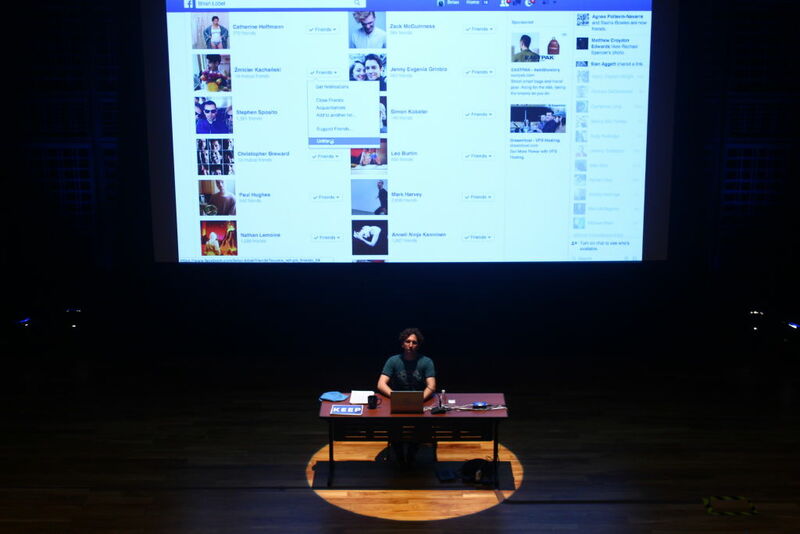 Most importantly, Lobel was thoroughly generous with his thoughts and genuine with his sharing of the various email responses from his friends back in 2011, when he first began this performance. With a simple format of introduction, audience interaction, email sharing, and one-minute narrations of a past memory he had with Grant (his late ex-boyfriend and best friend who inspired this performance) slotted in between sections, it was a powerful piece of art. Even though it may feel repetitive after a while, the performance stirred up plenty of emotions and brought many relevant topics up for discussion. Be it friendship, family, digital relationships or how one can justify anything in just a minute, I left the space changed – maybe not in a big way but with a slight shift in perspectives. It was a pleasure to have caught this performance lecture, and I daresay that it was one of the most useful lectures I have attended in my life. We also spoke to Brian Lobel on “Purge”, his family, and many other topics. Photographs Credit to NUS Centre For the Arts.